Las Mañanitas is a tavern restaurant offering Mexican cuisine. The average price of a 3-course meal at the Las Mañanitas restaurant is 18 euros. Note that although GoMadrid.com strives to maintain all information about Las Mañanitas up to date, the prices mentioned are only an indication and may not reflect the exact value of your meal. Las Mañanitas brings a little bit of Mexico to Calle Fuencarral in Madrid. Its decor is based on new Mexican art and Mariachi singers can be organised on request. The menu is a list of traditional Mexican dishes and diners can choose from different menus or from the chef's suggestions. The restaurant recommends the 'pibil' suckling pig but there are also tacos, enchiladas, quesadillas and nachos, which can be accompanied by a tequila, margaritas or even a daiquiri from their selection of drinks. The average price is 18 Euros. 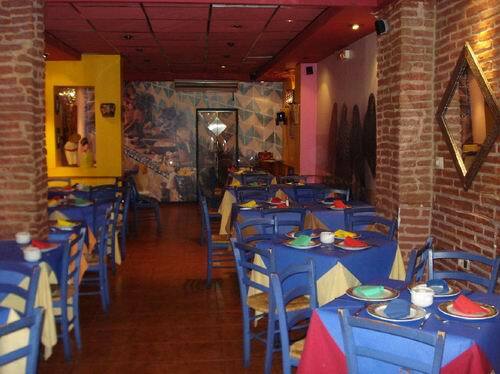 The address of the Las Mañanitas restaurant is: Fuencarral, 82, 28004 Madrid. The nearest Metro station is Tribunal. Please see the Las Mañanitas restaurant location map below.